Daphne Oseña-Paez says that her family life gives meaning to her achievements as a career woman. Daphne Oseña-Paez may be one of the country’s fashion and beauty icons, but she has a lot of things going on in her life that she rarely thinks of herself as one. The host/producer of Urban Zone has also evolved into a “lifestyle brand” by coming out with her own line of furniture, bed linens, and even jewelry. “I’ve always had a background in creativity and art. I’ve a degree in Fine Art History and Urban Planning at the University of Toronto. I’ve always envisioned that I would develop products that will make your home stylish starting with the linens. I have focused on licensing my brand kind of like Martha Stewart. 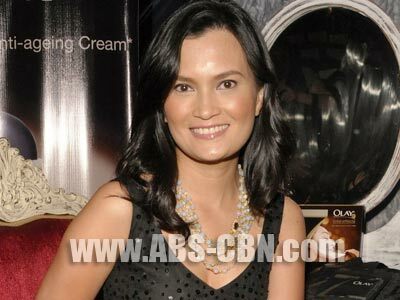 These are all lucrative operations by me and my partners in the industry,” said Daphne in an interview with ABS-CBN.com at a recent event for Forever Olay. But being a mother to three young girls, you’d be surprised at how Daphne managed to be a career woman and a devoted homemaker at the same time. “Sophia is 7, Lily is 4, and Bella is 1. It’s all about knowing your priorities and I’ve my rules from the very start. I say no to a lot of work. I say no to work that takes me out of town too much. I don’t know other TV hosts that would say no to a trip to Paris, but I’ve said no because for me children are only young once and I really want to be there for my children.” Obviously, spending quality time with her family is still her number one priority. “I think that is the biggest blessing that I am really grateful for. None of this would mean anything without my husband and children who are so healthy, beautiful, and loving,” she added. Daphne further shared that she once had the chance to join showbiz, but she declined simply because it’s not her thing. “I know my strengths and weaknesses. I’ve been offered before to be part of a teleserye. And I’ve been offered a part in the movie A Very Special Love as John Lloyd Cruz’s sister. My name is actually in the credits but it was only in the photos that I appeared. I am terrified of acting. Maybe one day [I’d try acting], if I drink enough wine. I don’t know,” she related with a laugh.